Now that September 8th is in our reverse viewscreen, we're left with the lingering question: did CBS and Paramount make it the celebration the franchise (and its fans) deserve? 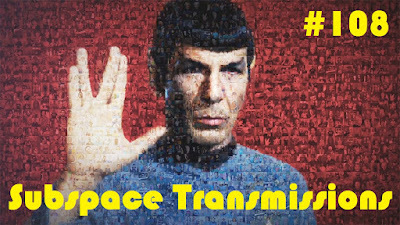 This week hosts Cam Smith and Tyler Orton continue the festivities by taking a critical look at the efforts expended for the 50th, as well as review director Adam Nimoy's loving and in-depth new documentary about his universally adored father, For the Love of Spock. In addition to these two hot topics, the duo also reveal how they honored Trek's momentous milestone, and their takeaways from a recent theatrical viewing of the always controversial Star Trek: The Motion Picture. Wanna appear on the show? Shoot us a 30 to 60-second audio clip telling us your thoughts on FOR THE LOVE OF SPOCK and/or THE 50th ANNIVERSARY and you could take the spotlight in an upcoming program! You can also send any other questions, topic ideas or feedback to subspacetransmissionspod@gmail.com! Join us next week as we debate the future of the Kelvin-verse on the big screen!